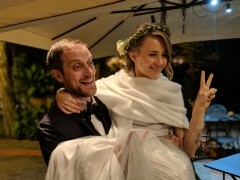 A week's stay in Venice during half term week followed by a night in Florence to attend Lorenzo and Olya's wedding. An afternoon flight to Venice, then spent an absolute age at Venice airport waiting for our bags to arrive, before finally getting on a boat to Venice proper. Checked into our apartment then went for dinner at a nearby restaurant, put the girls to bed, then Leon and I went out for a night time wander. Didn't really do very much today, safe in the knowledge we had the whole week ahead of us - so just mooched around in the vicinity of the apartment mainly. Really got into our stride today after today's rather unambitious mooching about. 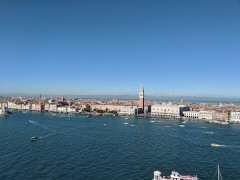 Took the vaporetto down the Grand Canal, with a quick stop off at St. Mark's Square, then over to San Giorgio Maggiore to take in the views from the campanile. Next stop lunch at an old favourite - La Palanca on La Giudecca. From there we took another vaporetto back to the main island, and went for a post lunch drink at Cantinone Gia Schiavi, across the canal from San Trovaso. Gradually wound our way back to the apartment from there. In the evening Jeremy and Alice arrived, and after dinner Chie and I went for a night time stroll around Venice. 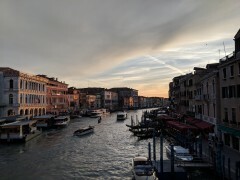 Shopped at the Rialto Market in the morning, lunch from a takeaway pasta place, then spent the afternoon at the Giardini part of the Biennale. A rather lavish and ambitious meal cooked by Jeremy at the apartment in the evening, then after dinner Leon and I snuck out again for another night on the town. I had planned to venture out into the Venetian Lagoon today, hoping to visit Torcello. 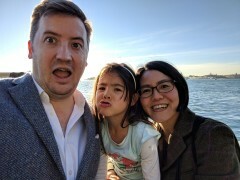 Unfortunately I only got as far as Burano before I got a message from Jeremy that Alice was quite sick, so I headed back to the main island to give him a hand taking her to the hospital. 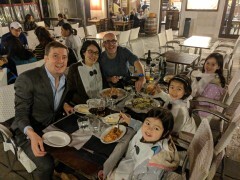 Met up with Leon, Chie and the girls again later in the afternoon for a short bacaro crawl and a trip on the traghetto. Basically ate our way through the day today. A late morning visit to a pasticceria followed by lunch at Il Refolo, a pizza place in a delightful spot with a little square and a canal and a bridge. Out again in the afternoon to visit the Aqua Alta bookshop, then some particularly good gelato. Dinner in the evening at a somewhat misjudged place near the apartment which was a bit too upmarket. Last full day in Venice of this trip. I got up early and walked down to St. Mark's to see if I could catch any of the sunrise, but only got a glimpse really. 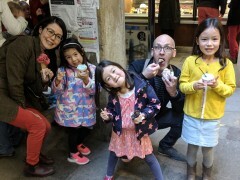 Chie, Erika and I went to another pasticceria in the morning then to the Arsenale to see a bit more of the Biennale. 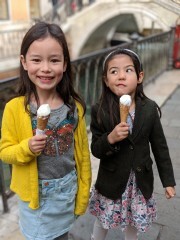 Later on in the afternoon we met up with Leon, Aiko and Mei and finally caved in to pressure from the kids to have a ride on a gondola. It was surprisingly nice. Left Venice in the morning, got a train to Florence to attend Lorenzo and Olya's wedding at the Palazzo Vecchio. A bit of sightseeing in the afternoon while the newlyweds were off taking photos around the city, then headed out into the Tuscan countryside in the evening for the reception. 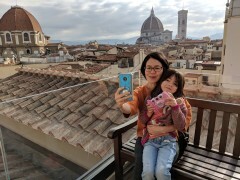 Breakfast at our hotel in Florence in the morning, and a chance to take in some last views of the city from the hotel's terrace, before heading off to Florence airport and flying back to London.